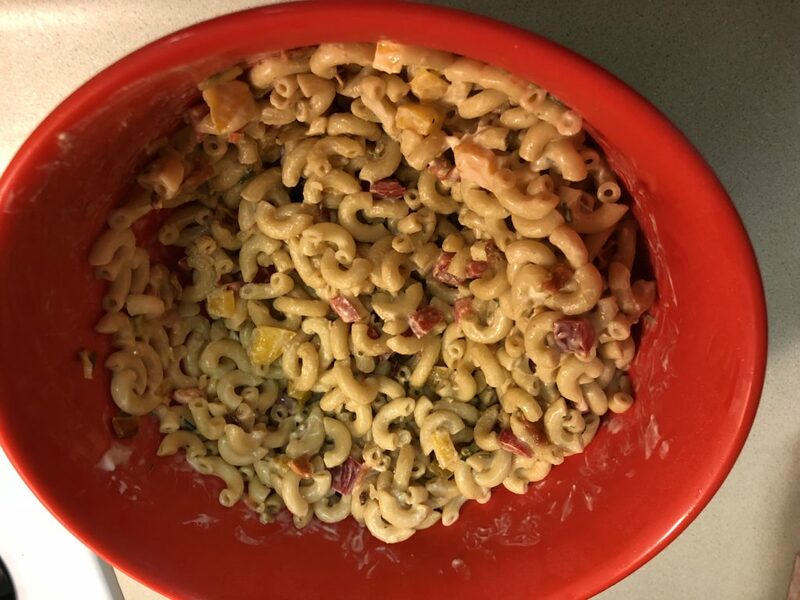 For the life of me, I can’t remember where I found this recipe, but I know it was called spring macaroni salad. I know the original had a few extra ingredients, some of which I didn’t like so I adapted it. Rosebud loves this salad and the whole bowl goes quickly when I take it to family gatherings. Cut peppers into small pieces. Since Rosebud was eating it, I chopped them up into tiny cubes. I used 1/2 red pepper and 1/2 green pepper, but you can use one whole pepper if you wish. Once macaroni is cooked, drain water and add peppers and vegetable soup mix. Then add mayo. I used five table spoons, but you might want more or less. After everything is mixed together. I put it in the fridge for an hour or more before serving.